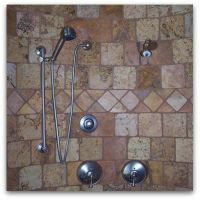 We do the majority of our Decorative Wall Tile in Showers, but we also do a fair amount of this work on Kitchen Backsplash areas as well as on Fireplaces, Wainscoat applications and on Feature Walls. You are truly only limited by your imagination when it comes to wall tile, although occasionally the material itself will impose certain restrictions on what can be done. Although some of the Decorative Patterns in this section are pre-made Listelles, many more of them are patterns that we created using the material that we had on-hand.